Arguably the world’s best USB Microphone has been miniaturised and made even better for all content creators out there! The Blue Yeti Nano is a premium USB Microphone which is designed for everyone interested in creating. For example, podcasters, YouTubers, Gamers, Streamers and even in the workplace with SKYPE and VoIP! The Blue Yeti features 24-bit sound quality, an incredible compact design and is easy to use, simply plug and play! From our testing there is no lag or latency, there’s a headphone output allowing for monitoring. There’s also mic muting and pickup pattern choices available directly from the microphone too. 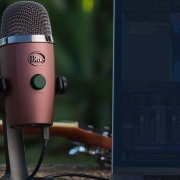 The Yeti Nano is incredibly versatile, as it allows users to record single or multiple sources at once! Simply tap the pattern selection button on the device to set one that’s right for the content you’re currently working on. Cardioid mode is perfect for single host podcasters, game streamers and voice over artists as it is dealing with a single voice or source. Omnidirectional mode is great for those when there is more than one person/source being recorded. Such as a dual host podcast or a conference call with more than one person in the room. The Nano is very very clear. It was designed with two proprietary mic capsules which are designed specifically to give voices presence and detail. The Blue Yeti Nano supports high quality 24bit/48khz recording, allowing for crystal clear audio each time! The Yeti Nano is beautifully designed and looks great on camera. Making it the perfect microphone for those who record their podcasts on camera or a video game streamer. What do we like the most about the design? The little channel on the metal stand which allows for a sleak input of the wire. No more wobbly or messy microphones! Set up is a breeze as Blue have made the Yeti Nano easy to use, whether you’re a beginner or an expert content creator! Simply plug in the device and you are good to go! The device works across a multitude of programmes such as Adobe Audition, Audacity or Garageband. Whatever your software of choice. It just simply works. You can even use the Yeti Nano with a boom arm! Simply purchase the Radius III shock mount and attach it to a Compass Broadcast Boom Arm! The Blue Sherpa Companion App will allow content creators to get the very best from the Yeti Nano. Mute, Unmute microphones/headphones, fine-tune gain and levels, switch polar patterns, and change sample rates all in one place! What’s even more impressive about Sherpa? It will download any firmware updates directly to the Yeti Nano!